There also is a good chance you don’t know what that is. It is simply a bargain-priced wine made by Charles Shaw Winery. The wine took the country by storm when it was introduced in 2002 in Trader Joe’s stores in California, selling for $1.99 a bottle. Shipping costs push that up to $2.99 or more on the East Coast, so make that Three Buck Chuck. Even at $3, it is an incredible bargain, so whenever I am in a Trader Joe’s I make sure to pick up a few different varietals. A friend of my friend Irvin thinks I write too much about more expensive wines and not enough about the inexpensive wines more people drink. That may be true, but the real bargain wines aren’t very interesting. They usually are drinkable, but not remarkable. Many wine drinkers are looking for that wow experience you find in the more expensive bottles. That’s why the $15-25 category is the fastest growing niche in the country. Most of us don’t want to break the bank, but we are eager to see if the extra money spent on premium wine is worth it. Most of the time it is. But there also is a place for the inexpensive, ordinary wine, which some wine snobs call “plonk.” That’s where Three Buck Chuck comes in. If you just want a nice, simple wine with your pizza or burger, you will be just fine with one of these wines. Charles Shaw’s parent company owns huge vineyards in California’s San Joaquin Valley, where grapes don’t cost as much as in Napa, Sonoma, Paso Robles, or other premium areas. They also keep overhead low through lighter glass for the bottles and cheaper corks. Instead of expensive oak barrels, they use oak chips to give the oaky flavor to some of the wines. These aren’t wines to lay down for any length of time, so you don’t need some of the things that raise the price of premium wines. Inexpensive is great, but how do they taste? In my experience there is no one answer to that question. Some of them are fantastic, and others are barely so-so. The trick is to buy a bottle of a varietal you think you would like, and if it meets your expectations, go back and buy more before they sell out. The wines vary from year to year, and even from batch to batch in the same year. But if you buy a bottle or two and don’t like the wine, you haven’t lost much. And over the last 8-10 years that I have tried Charles Shaw wines, there never has been one that was awful. For this column I picked a Charles Shaw Chardonnay 2017 ($2.99), because I have found the chardonnay to be the most consistently good over the years. It is a pale yellow in the glass with mild citrus aromas. It has a pleasant taste with some citrus, tropical notes and a hint of oak. It is a medium bodied wine with a short finish. You don’t get a lot of depth and complexity from this wine, but it is an enjoyable experience. There is a good balance between fruit and acid, making for a smooth flavor. Near the top of the foil neck that covers the cork there is a pull tab that makes it easy to peel off part of the foil and expose the cork. I think that’s a nice touch because sometimes folks struggle with taking off the foil without making a mess. Charles Shaw chardonnay even won double gold and was named the best California chardonnay at the 2007 California State Fair Commercial Wine Competition. By law the grapes in the wine have to be at least 70 percent chardonnay, but the company doesn’t say what the blend is. You also can’t tell where the grapes come from. The front label says California, so the grapes could be from anywhere in the state. The back label says “cellared and bottled in Napa and Sonoma,” so some people might think that’s where the grapes are from. I also tried a red blend that was terrific. It was smooth and mellow, with dark fruit flavors like blackberry and plum. I could find no information about the blend, so just about anything could be included. Winery: Charles Shaw began his winery in the 1970s and created some good Beaujolais-style wine. When he ran into financial difficulties and declared bankruptcy, the Bronco Wine Company bought the brand in 1990. Bronco didn’t do anything with the label until a glut of wine grapes created conditions that led to the $2 bottle of wine. Bronco is owned by Fred Franzia, who once famously said no one should pay more than $10 for a bottle of wine. Bronco offers more than 80 different wine labels at varying price points, many of them discount wines. At their Ceres, California, winery, they produce 90 million gallons of wine every year, or about 250 bottles per minute. The wine is made in 7,000-gallon tanks, which are 10 times as large as those used in many small wineries. They have 45,000 acres of vineyards and buy surplus grapes in bulk from other growers. Since 2002 Trader Joe’s has sold more than one billion bottles of Charles Shaw wine. The Charles Shaw lineup includes cabernet sauvignon, pinot noir, merlot, rosé, zinfandel, white zinfandel, chardonnay, sauvignon blanc, pinot grigio and nouveau. The company has introduced an organic line that sells for $4. Goes with: We had the Charles Shaw chardonnay with a simple meal of steamed shrimp and a tossed salad. It was a great pairing because I didn’t need a lot of complexity from the wine with shrimp. We drank the red blend after dinner sitting by the fireplace on a recent cold night. It was a good wine for sipping, and a bowl of pistachios made it even better. 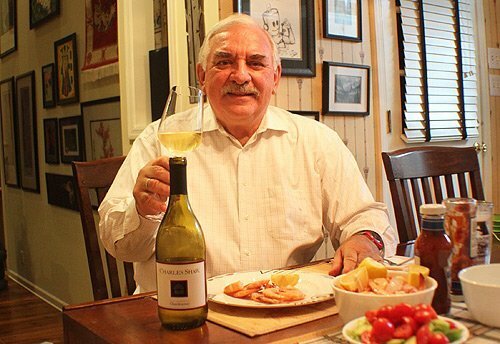 The chardonnay would pair well with most mild fish and seafood meals. The red blend would go nicely with a burger or pizza, or most red meats and hearty cheeses. The red blend also would be outstanding for making sangria.